As scheduled in July, the first RP110 was successfully launched by Horizon. 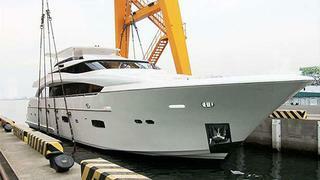 Christened Andrea VI, the motor yacht has completed her sea trials with her owner on board this week. As reminder, the RP110 series is designed by JC Espinosa with naval architecture of Donald Blount. Powered by twin 1,417kW Caterpillar engines, her sleek design will allow a top speed in excess of 18 knots, a cruising speed of 15 knots and easy manoeuvring. The interior of Andrea VI accommodates eight guests in four cabins including a master on the main deck, a VIP, a double and a twin on the lower deck. The RP110 series is also available for 10 guests in five cabins. This 33.53m raised pilothouse motor yacht series is already claimed a success for the Taiwanese yard, with the order of a second hull in June and the order of a third hull in July. And others are expected with the visit of four potential owners this week. Andrea VI will soon be shipped to Florida, where she will be delivered and make her debut at the upcoming Fort Lauderdale International Boat Show in October.